I was checking out of the library with my daughter last week when I happened to see a little sign posted above one of the librarian's desks. 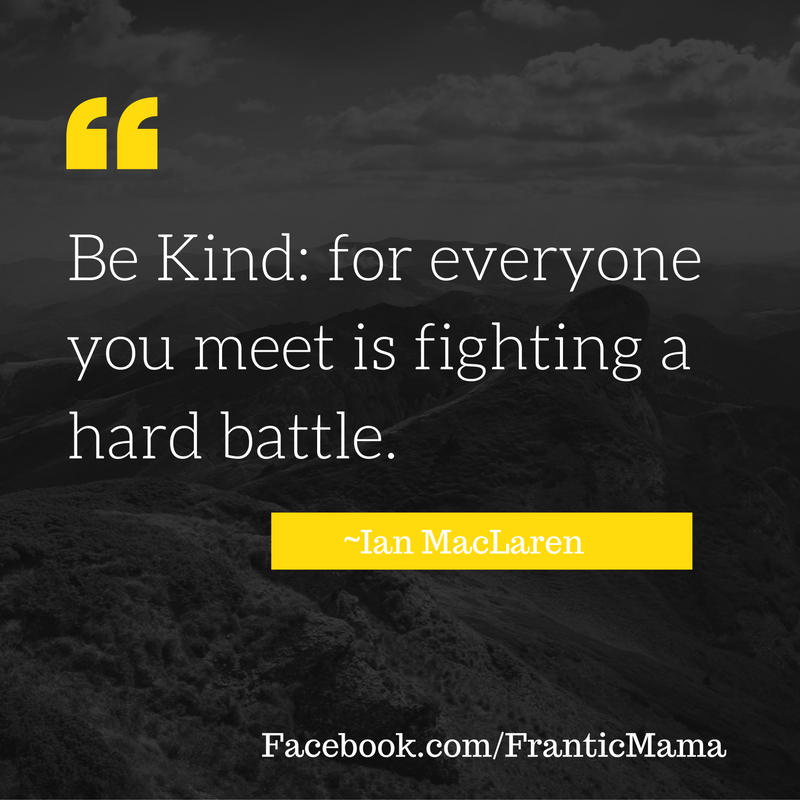 It read: "Be Kind, for everyone you meet is fighting a battle you know nothing about." Whoever wrote it (and whatever version you read), wow. I've seen it before, and I think remembering its message is one of the keys to compassion and kindness. It's so easy for us, all caught up in our own lives, to forget that every single person around us also has their challenges-- whether they let you see them or not. And no, most people won't let you see their hardships. 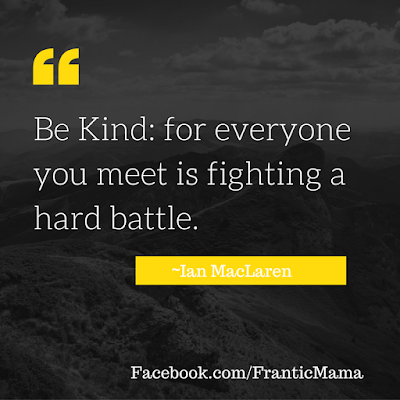 Especially the person you assume "has it all"-- trust me, they're fighting battles just like the rest of us. Ones we know nothing about. This hit home recently: We have a rather grumpy postal worker. She never smiles at a greeting, never says hello. She looks angry. My son, ever-attuned to rudeness or injustice, exclaimed loudly "I hate that lady!" Hey, he's aware of subtleties, but it doesn't mean he can use them [yet]! Yikes. Anyway, he went on to ask me why she was so "mean." It would be easy to write her off as just a nasty person, right? But how many people are truly and inherently mean? Who at their core doesn't have a good soul? Very few. I think it's probably more accurate that she, like all of us, is fighting a battle of her own, and hers is likely a very hard one. I took a deep breath and explained to my son that some people have extremely hard lives, and that she must be going through something difficult (I didn't think it was necessary to list all of the true possibilities of hardship-- those would rest too heavily on his soul). He actually did seem to understand what I meant, at just age 6. I think little ones understand it more than we think. I was proud of that moment. I was proud I took the time to explain it, and that my son took it in. I want to teach my children compassion and the ability to look beyond initial impressions and assumptions. I hope that instance was one small step towards reaching that goal. How do you teach your children the meaning and importance of kindness? This is thought-full, and with meaning we mostly keep brushing aside. I love that you took the time to look up at a sign, to find it engaging enough to look fir its origins and then for it to come rescue a moment and transform it into a lesson! And children they are indeed more capable than we ever may think. You are a beautiful writer( my favourite) and a beautiful person too. I am going to remember this, and maybe take it forward when the opportunity with my children arises. See how you touch people's lives! I love being here! You are such a gem, Swati! Thank you. It is such a treat to read your comment and know you stopped by :). It is fascinating just how much children understand, isn't it? What a beautiful lesson for people of all ages. How lucky your son is to have been taught this at such a young age. I am sure it is something that he will never forget. Thank you, Beth! Your note really put a smile on my face when I read it first thing this morning (I like to check my e-mail as soon as I wake-- before the kids are even on me!). I really appreciate your thoughts and I do hope my son remembers that little talk, or at least the message I wanted to impart. P.S. Checked out your blog! Congrats on starting one. Now you can't say no one has ever read it ;).